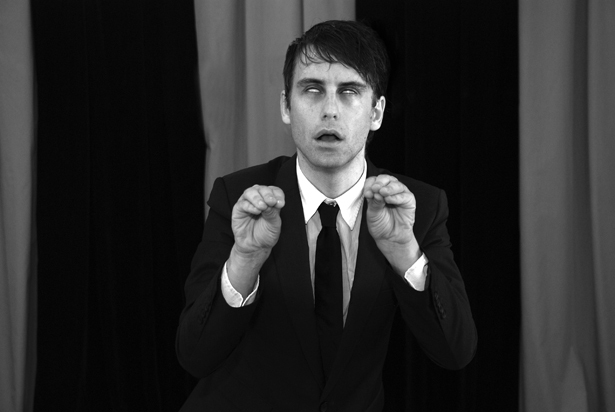 Ryan McNamara, The Latest in Blood and Guts (videostill), 2009. Under A Tinsel Sun is the title of the III Moscow International Biennale For Young Art, organized by the Ministry of Culture of the Russian Federation; the Department of Culture of the City of Moscow; the National Centre for Contemporary Art (NCCA), Moscow; and the Moscow Museum of Modern Art (MMOMA); in collaboration with Neuer Berliner Kunstverein (n.b.k.). Its chief curator is Kathrin Becker. Along with the Main project the Biennale includes the Strategic project, curated by Elena Selina, a range of artists’ fanzines, selected by Viktor Neumann, as well the Special program of curatorial projects, and an extensive Parallel program at various locations in Moscow. For the first time, the Biennale features an Educational program including workshops with international artists, panel discussions, lectures, and screenings. The Biennale is accompanied by a comprehensive bilingual publication. The III Moscow International Biennale For Young Art, as its forerunners, focuses on a young generation of artists aged up to 35 years. Titled Under A Tinsel Sun and laid out as a multimedia project, it portrays the heterogeneity of subjects, languages, and styles, which are so urgent in this generation, and at the same time looks into the content-related positioning of these artists born between the mid-1970s and the mid-1980s, as well as into the conditions for their development in terms of content. Under A Tinsel Sun assumes that, despite the cultural, economic, and social differences that may exist between the participants from different countries, there is a common factor in the impossibility of locating oneself by belonging to certain peer groups (whether in the ideological or in the artistic sense). With the absence of a “we,” the self-positioning of the individual becomes the pressing imperative of the present especially when being aware that “reality” as such is constructed, subjective, and fragmented. This realization becomes the drive for the artists’ self-positioning and for their production of works that no longer describe an “objective” reality but catalyze a multidimensional and alternative perception of the world. The Strategic project is seen as an “additional set” with a different concept. The Biennale open call applications not included in the Main project will be reviewed from a different angle. The project aims to study the status of young art today, and to determine the main tendencies and trends.